Rubber Bricks from swimming pools: rubber around a central brick or pure rubber through and through? We weren’t sure either, so we bought one and sawed it in half. The bet could have gone three ways. Pure rubber, rubber over brick, or rubber over another form of weight that wasn’t rubber. 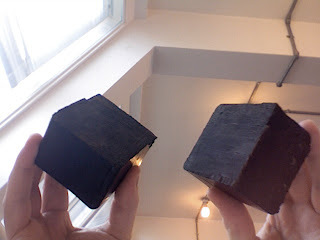 The brick arrived, we sawed it in half… pure rubber. We sawed it into quarters… still pure rubber. And someone lost £13.40 – the price of the aforementioned brick – including postage and packing. That someone would like to add, that had a certain other someone not bought a junior brick, and instead purchased the ‘Lifeguard association standard’ 10lb model, we would have found a steel weight inside – thus voiding the bet and assigning the shared price of the brick to all participating parties. The losing party then phoned the internet swimming pool accessories dealer to complain that there was no brick inside the so called ‘rubber brick’, the retailer hung up.